Camillo Sitte’s seminal book, The Birth of Modern City Planning (Vienna, 1889), is focused primarily on compositional recommendations for urban squares, but his preoccupations were partly triggered by his reaction to the master plans for new residential districts in the rapidly expanding cities of late 19th Century Europe. Since Sitte’s intended audience included an emerging class of planning officials, as much as architects, he goes out of his way to critique the status quo and then uses arguments grounded in the pragmatics of speculative real estate development and transportation engineering to make his case. His primary goal is to encourage the creation of new urban spaces that have the variety and richness of linked streets and plazas that had evolved over centuries. After articulating the virtues of spatial definition and perspectival space by citing dozens of urban squares in Italy and Germany, he uses two pragmatic arguments to make his case. The first is grounded in transportation planning principles before automobiles and automated traffic lights. Sitte makes a case that three-way intersections, rather than the four-way intersections created by the conventional gridiron street grids that were being used to expand Europen cities, result in fewer traffic conflicts. The theoretical benefits of T-intersections post-justified Sitte’s preference for complex neighborhood district plans. Likewise, Sitte justifies his preference for idiosyncratic street layouts and parcels by extoling plans that acknowledged pre-existing parcel boundaries and natural features. In addition to the aesthetic benefits of a plan more closely knitted into the contingencies of the existing site, site acquisition and phasing would be simplified. We have used the same arguments when developing alternative master plans for Boynton Yards in Somerville as part of our work on the Union Square Neighborhood Plan. 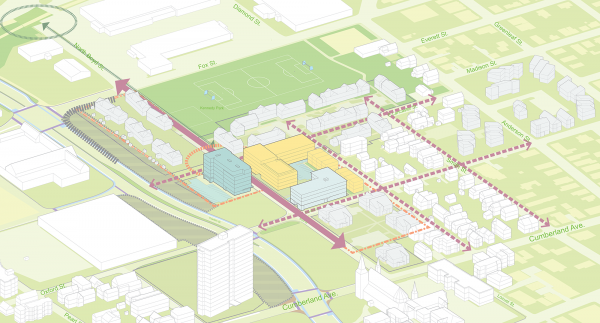 A combination of remnant industrial uses, small scale urban renewal interventions to improve truck access, and a blurry line between industrial and residential uses has resulted in a crazy-quilt of parcel boundaries that provided a rational basis for creating a richly textured plan.